Burlington, VT-- Five downtown and town center Vermont roundabouts totaling 52 years operation attained a remarkable pedestrian safety performance recording only one minor pedestrian injury. With two of the earliest downtown and town center roundabouts with considerable pedestrian activity in the U.S., Vermont becomes the first to tabulate actual pedestrian accident numbers. Additionally car occupant injuries, all minor, totaled four and no bicycle injury occurred. February 3, 6:30 p.m. at Arts Riot, 400 Pine St.
Let's shape it to become a street the public can love! Assure safety, especially for those who walk and bike, while reducing global warming gases and other pollutants, cutting gasoline use, and intersection delay. The current Parkway now promoted by the City, Vermont Agency of Transportation (VAOT) and the Federal Highway Administration (FHWA) gets very little right. Most importantly the current Parkway completely fails the following critical tests. The City’s Parkway design results in a net drop in safety for each mode. Added to poor safety: the current Parkway design would increase global warming gases and other pollutants, waste gasoline, strangle economic vitality, cut off connectivity to key adjacent areas, and damage neighborhood livability. Therefore, Safe Streets Burlington (SSB) calls for stopping the project design followed by developing revisions centering on major upgrades to safety, reducing environment impacts, and increasing economic benefits. --first chance for residents to speak AND question on Parkway since 2006! Time to Stop! Re-Evaluate! Imagine! 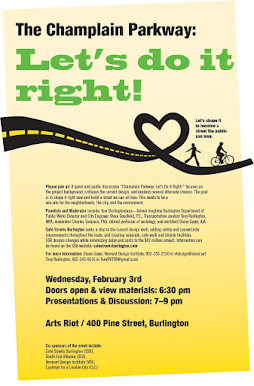 BURLINGTON, VT—A panel and public discussion “Champlain Parkway: Get it Right the First Time” focuses on the project background, critiques the current design, and explores several choices for change. 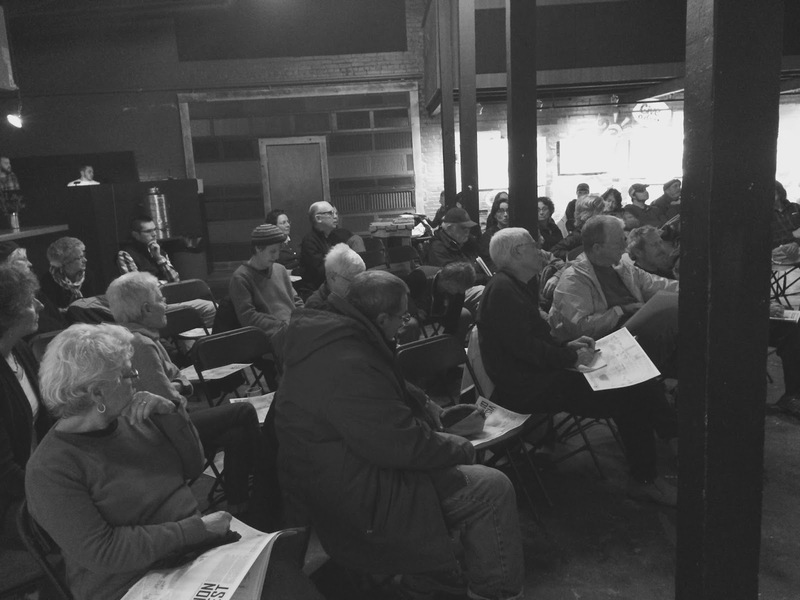 The Wednesday, February 3 event set for 6:30 p.m. at ArtsRiot, 400 Pine Street, opens at 6:30 p.m. to view maps and materials followed by the panel presentations and discussion 7-9 p.m. 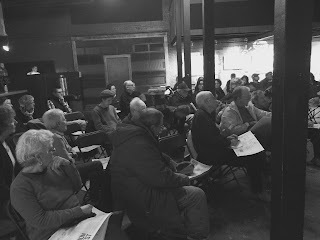 The panel presentation and community discussion on Alternate Designs for the Champlain Parkway, Pine street Corridor, and Railyards Connection. Alternate Designs are based on current best practices for community development and transportation facilities. Four Burlingtonians comprise the presenters: former longtime Burlington Department of Public Works Director and City Engineer Steve Goodkind, P.E., transportation analyst Tony Redington, MPA, architect Diane Gayer, AIA, and moderator Charles Simpson, PhD, retired professor of sociology. The co-sponsors of the event include: Safe Streets Burlington (SSB), South End Alliance (SEA), Coalition for a Livable City (CLC), Vermont Design Institute (VDI), and Save Open Spaces (SOS). Topics include: strengthening the street network, roundabouts, stormwater, ecosystems health, lower carbon footprint, "walk to school", separate and safe walk and bike facilities, railroad needs, etc. The sponsors call for a win-win solution that meets the needs of the 21st century rather than spending $43 million on a program from the past! Join us at the Public Workshop to learn about proposals in the draft plan, including pedestrian and bicycle infrastructure improvements such as roundabouts and cycle track (protected bike lanes). Marry the City Market South End Parking Entrance Direct to a Champlain Parkway Roundabout! The plans move forward for Burlington's City Market South End facility at the Corner of Flynn Avenue and Briggs Lane. Now the plan calls for one entry onto Flynn Avenue adjacent to the rail line and a second from Market parking area via Briggs Lane, then onto Flynn Avenue very close to the current Parkway signalized intersection of Flynn/Parkway. A direct, safe access of City Market onto the Champlain Parkway can be done two approaches—a Parkway roundabout intersection at Ferguson Street emptying directly into the Market parking area, or bending Briggs Lane into a Parkway/Flynn roundabout as a fifth “leg.” Either approach marries the parking area directly to a safe roundabout, safe for all modes. The Burlington Onion River Coop "City Market" is the highest revenue coop market in the United States. Either roundabout design allows the benefits of closing the intersection of Briggs Lane and Flynn Avenue, providing up to a third of an acre of available land along the east side of the Market between Flynn and Ferguson west of the Parkway, direct Parkway to Market access for all deliveries, and sharply reducing traffic on the difficult Flynn/Market entrance on the west side of the Market. The Burlington Walk Bike Council and Safe Streets Burlington group both call for all roundabouts along the Parkway. And, since the Parkway becomes, essentially, a local street once it reaches Home Avenue, adding another roundabout intersection at Ferguson/City Market makes good sense as Market traffic will very likely reach about ten percent of the intersection total traffic, the rule of thumb for minor roadway traffic for roundabout feasibility. If a Ferguson roundabout is chosen about a third of an acre of the former Biggs Lane becomes available, and those traveling from the nearby Ferguson Street neighborhood, particular walking or biking, would have much safer and shorter trips to the Market. Either roundabout design connection with Briggs Lane helps the economic viability of the current southern portion of the Market property as well as all points south to Home Avenue.